In this puppy video First Steps, you'll see a couple puppies trying to walk on a variety of surfaces. We think first steps are cute whether they are taken by a human baby or our four legged companion. Puppies must learn to walk just like humans and their first attempts at moving around usually involve a type of crawl. This normally begins around the third or fourth week of life and crawling gradually becomes walking. By the fifth week of life, the puppy is tries to run. It doesn't take long for the puppy who is inquisitive and wants to investigate his surroundings, to go from crawling, to putting weight on one or more paws to walking and then running. This entire process usually lasts less than one week. Not all puppies proceed at the same rate. The little guy in the video just doesn't see the need to walk. After all, his mother is close by to keep him warm, cuddle, and keep him well fed. For those puppies, a little bit of help from the humans that care for them is needed. Puppy development is very quick when compared to human development. This video is not meant as a tutorial, just something for fun. We hope you enjoy. If you enjoyed this video, you might want to check out some of the other short clips that we produced including one on Malti-Poo puppies, Mal-shi Puppies and Shih Tzu puppies. 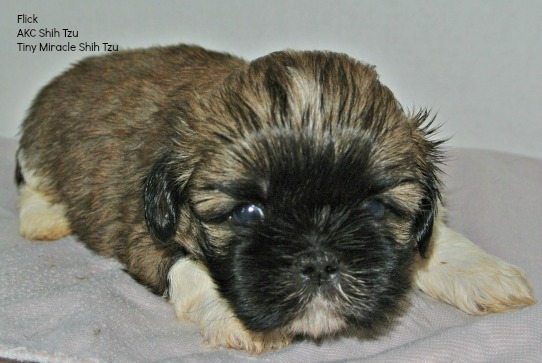 We're always either thinking about, planning, filming, or editing a video, so if you have an idea for a Shih Tzu, why not make your voice heard. Use the form below to request either an informational or cute video that would help make your life better with your Shih Tzu dog. Scroll down to the bottom of this page and fill in the form.